In my last post, I mentioned being a 100 Percent Pure Approved Blogger, which means I'll be telling you all about the newest Pure products, in addition to my usual 100 Percent Pure purchases. 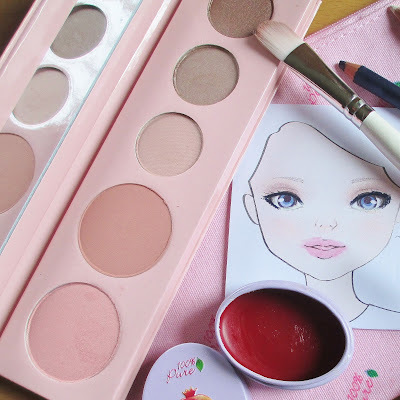 Today I'll be showing you a closer look at the Pretty Naked Palette and Pomegranate Lip Butter from the most recent gift with purchase (luckily, you can still buy these separately), as well as three new eye makeup products. Here's a closeup of the Pretty Naked Palette, which is a good transition palette to get if you are just switching over to natural makeup (or love a natural look). I think it works for everyday and can easily be a base for a more dramatic look. You can get a better idea of the colors, as seen on the illustration. I also used the Pomegranate Lip Butter, and the new eyeliners and mascara on the illustration. The eye shadows in this palette include Flaxseed, Toffee and Chestnut. I like to use Flaxseed as a base color, including on the brow bone, and Toffee and Chestnut in the crease. To make my blue eyes pop, I actually use the Pretty Naked Blush and/or the Luminizer from the palette on my lid. You'll also notice that I kept the look natural in this pic with just the Pomegranate Lip Butter on my lips. Then, to amp things up a bit, I decided to test out these new eyeliners, the 100 Percent Creamy Long Last Liner in Bright Eyes and Royal. These liners are creamy and glide on smooth, but are still a good consistency for getting a sharp line. They also last all day, even in the rain (which explains the bad lighting in the pictures of me wearing it; yes, I got rained on and there was a lack of natural light). I like to apply the Royal liner as usual, and add a bit of the white Bright Eyes along my lower lash line and in the inner corners of my eyes. The combo of the two really does brighten my eyes. The Royal even works well with my blue eyes, as it is a deep navy, with a hint of purple, but not as purple as the Blackberry Long Lasting Liquid Liner I posted about in the past. The best part of today's makeup look is that I had the opportunity to test out 100 Percent Pure's new soon-to-be officially released Maracuja Oil Mascara, which is gluten-free and vegan. The mascara I had been using from the brand actually is in the "beegan" category. Personally, I think the Maracuja Oil Mascara glides on smoother, separates my lashes better and removes easier. It's my new fave. Let me know on Twitter at @Rawdorable and/or on my Instagram page (also @Rawdorable), if you try this Pure makeup look or get a chance to try the new eyeliners and mascara. *100 Percent Pure sent me these products to review. All opinions are my own.